Father West Magnetic and 16 year old daughter Raevv’n team up on this hypnotic and gritty deep-tech project. “The Treason” is a late night dancefloor filler with an unforgettable and deeply melodic hookline. “The Treason” release aslo features alternative mixes from West Magnetic and Strobe Records producer Ron Allen. Raised in Toronto, with a singer/songwriter mother (Usra Leedham) and the house producer father (Pier Shu-Lutman – West Magnetic) Raevv’n was always surrounded by music. Raevv’n’s songwriting and vocal style are influenced from such diverse artists as Usra Leedham (her mother), Natasha Bedingfield, Stevie Wonder, Kelly Clarkson and Alicia Keys. From an early age, Raevv’n’s play time usually meant recording songs in her father’s studio. It was therefore inevitable that Raevv’n’s songwriting & vocal talent would end up on her father’s house productions. Her unique songwriting skills and amazing voice is perfect counterpoint to West Magnetic’s dirty, melodic production style. Pier Shu-Lutman’s music career started with releases with Om Records in 2000. This culminated with the release of “Can’t Stop” featuring the beautiful and talented vocals of Raevv’ns mother Usra Leedham. Other classics followed including the single “Give It Up For Free (feat Usra Leedham)” from the full length ablum “Can’t Stop” that launched into the mainstream with remixes by Kaskade and Jori Hulkkonen. I want to apologize for the crappy site you see here – I have been busy with production projects and have severely neglected Strobe… but that is gonna change! http://www.stroberecords.com will be live again with a brand new site and there will be some other major announcements and new releases coming this summer. “Outta Here” is Chach’s first release off of her forthcoming album “Addicted”. This is her fifth follow up single to previous releases “Luv”, “Starlight”, and radio hit “Long Time” feat international recording artist Snow. PLEASE REQUEST CHACH “OUTTA HERE” ON YOUR LOCAL RADIO STATION TODAY!!! We sat down with Ron Allen (Strobe Records) and Johnny Lopez (Beats United Radio) and here’s what they had to say about their boy Nick. 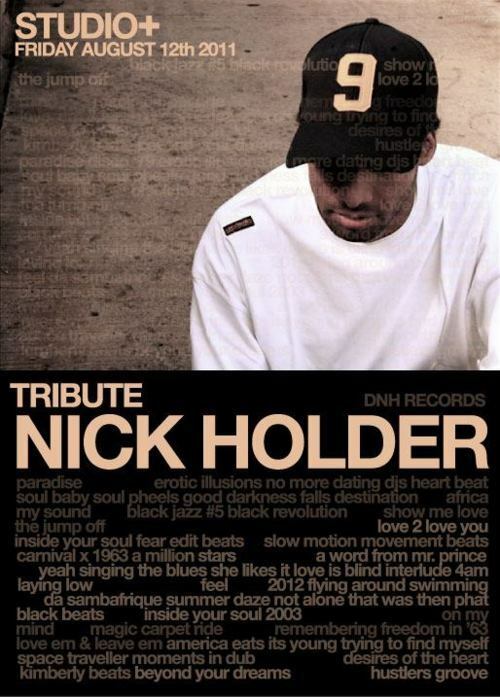 The Studio + ‘Tribute’ series continues this Friday August 12th, 2011 with guest Nick Holder,(DNH Records). Email: thestudioguestlist@gmail.com for guest list.